Tracy Abrahams : Super Cute Baby Card using Made with Love by Stampin' Up! Super Cute Baby Card using Made with Love by Stampin' Up! 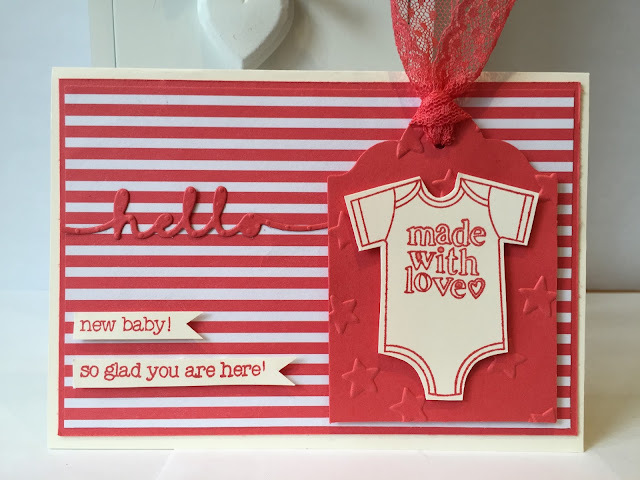 I needed to make a couple of baby cards super quick and thought I would use a great stamp set called Made with Love by Stampin' Up!. I decided to use Mint Macaron and Watermelon Wonder a couple of the great new in colours. The colours are so vibrant and fresh and really make the cards pop giving them a bright and cheerful feel. Don't they look great with the new Dotted Lace Trim ribbon, that's why I love Stampin' Up! everything coordinates beautifully. I used just a little bit of the ribbon and it makes such a difference. I do love this stamp set and can see myself using it again and again. I hope you like today's card I have added the products used below. I hope you have a lovely day I'm off to make some more baby card so I have them ready and waiting next time I need one in a hurry. I always love to send my customers a thank you card and if you use my September Code Club No 3VMWPRFB when you check out I will send you a special gift at the end of the month. Please tick the I would like contact section so I know where to send you gift to at the end of the month.